Three new university stadiums from the USA join StadiumDB today as we add one of our favourites: Lane Stadium with its magnificent single-tier stand holding over 30,000 people! Today it’s the single tallest building in town and its capacity exceeds East Lansing Population by over 20,000. But one of America’s best academic stadiums started off as a completely different facility. In 1923 it cost just $160,000 to build the 14,000 lowermost bleachers surrounding the field. Soon that size proved insufficient, so the single tier was expanded to 26,000 in 1935. By early 1950s, when Michigan State Spartans were admitted to the Big Ten, capacity went up to 56,000 with that same single tier. A year later it was 76,000 after upper decks were added on both sides of the pitch. Since then capacity hasn’t seen increases, but stadium infrastructure was changing gradually. New scoreboards, video boards, sound systems, disabled seats and other improvements were added. Finally in 2004 plan of the main grandstand’s revamp was launched, delivered in 2005. The upper deck was redone, while two floors of boxes topped the entire structure. Massive amount of commercial hospitality space was added (25,000 m2), offering 24 new skyboxes and many business seats. Enveloped by elegant brick façade, this upgrade consumed $64 million, hardly comparable to the initial cost from 1923. Aside of Spartans games the stadium played host to many concerts and other events. Some of them are unique, like the 2001 hockey derby between Michigan State and University of Michigan. It set the record for any hockey fixture (74,554 people) before that record eventually went to… the derby rivals at Michigan Stadium. Decision to build a new stadium at Virginia Tech was made in 1962. 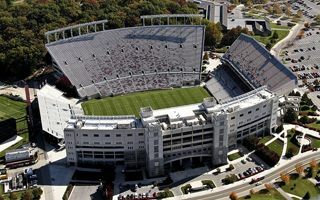 It meant doubling the capacity for Hokies home games from 17,000 at the old stadium to 35,050. However, despite 1.5 year of construction, the stadium wasn’t that big for Sept 1965 opening. It was delivered eventually in 1968. Its significant capacity was achieved by erection of just two stands along the sides, both curved slightly for optimum sightlines. Each was roughly 60 rows high and stayed that way until 1980, when the east grandstand was expanded by further 30+ rows. Since then it has 106 rows and with over 30,000 capacity is one of the largest free-standing single-tiered terraces in the world. Interestingly, expanding it cost nearly as much as building the initial stadium in 1965 ($3.2m to $3.5m). Since then there were only two more major alterations in the twentieth century. In 1982 floodlights were added, while in 1999-2000 the north end was finally filled with a permanent structure. It was then and still is the smallest grandstand of the stadium with roughly 5,100 capacity. That size is strictly limited by road running behind the stand. In 2004 the south end was finally enclosed. This time a double-tier stand was built with premium seating in place, offering a total of over 11,000 places. Almost simultaneously work began on upgrade of the western main stand. By 2006 new luxury suits (over 50) and brand new outer façade were ready, ending the most expensive redevelopment to date. The stadium’s name honours Edward Hudson Lane, a Virginia Tech graduate who contributed largely to the building’s founding. However, since 1992 the field is named separately, this time honouring Wes and Janet Worsham, long-time Hokies fans who also supported the university greatly. Formally the stadium in western Kalamazoo was opened in 1939, but its history is significantly longer. It was first used as a college football field in 1914, which means it’s actually over a century old! Initially a field with running track, the stadium later changed into football-specific. Erection of first two stands began in 1938, allowing over 15,000 people to see games of Western Michigan Broncos. It was a very economic project, worth only $250,000 altogether, even including the baseball field southwards. With the first expansion in 1973, the stadium then grew further in 1989 and since then has kept capacity almost steady, despite further changes in 1995, 2003 and later. The stadium’s layout is more interesting thanks to Seelye Center, an indoor training hall built north of the stands in 2003. Parts of the north end are incorporated into the hall, even corporate boxes. Waldo Stadium’s name honours Dwight B. Waldo, first president of Western Michigan University, who own the building.